Last weekend, Jake and I had a few friends over for drinks. After some planning, I had come up with a few appetizers to nosh on in addition to the obligatory cheese platter and crudetes. I would serve the Grape Tomato Bruchetta from yesterday’s post, Carmelized Onion Dip (keep an eye out for this recipe in the next week or so), and some Artichoke and Parmesan Phyllo Pastries. That morning, all of the preparations were going well. The bruchetta was marinating in the refrigerator, the Onion Dip was warming in the oven, and I was ready to begin the phyllo pastries. I was feeling good. Defrost the dough in the refrigerator for at least 8 hours. Eight hours?! People would be showing up within two! But I’m crafty. I can deal with a last minute hurdle or two. I would defrost the sheets in the oven. I took the pastry out of the box and began to unroll it…… aaaand broke off the edge. Maybe I’m not as crafty as I think. Ugh. At least I had the other snacks. But then I remembered the filling. Artichoke, parmesan, and garlic? That could have potential for a dip. I tasted it to see if I should add sour cream or something to make it more creamy… and it was delicious! Nothing else needed! This filling could definitely stand on its own. Drain the artichoke hearts, reserving marinade. In food processor (I used my handy magic bullet), blend the artichokes, garlic and parmesan, pulsing the motor until the artichokes are finely chopped. And that’s it! A dip is born. This dip is SO easy to make, and surprisingly delicious! Serve it with these super easy homemade tortilla chips, and you’re good to go. 1. Spray each tortilla with cooking spray. Sprinkle lightly with spices. 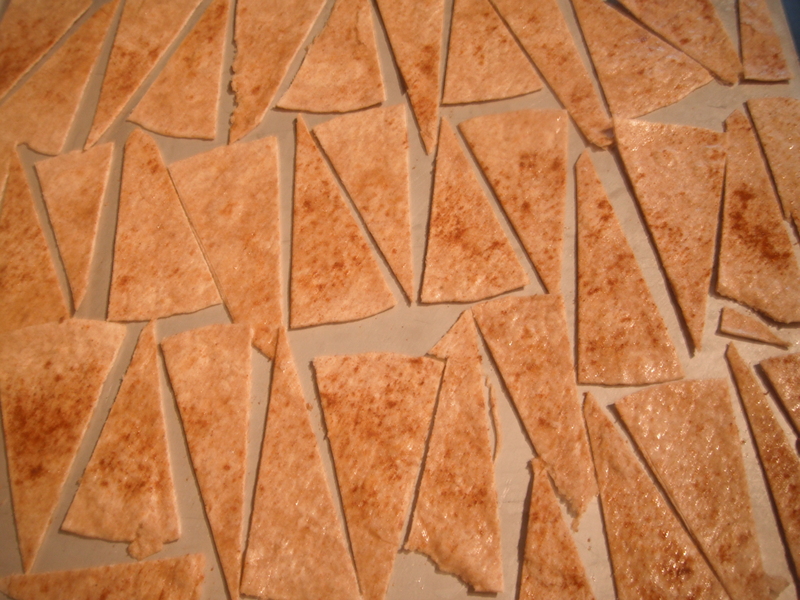 Stack tortillas and cut in half, then quarters, then eighths, and sixteenths. 2. Arrange the pieces in a single layer on cookie sheet. Bake at 350 degrees for 5-10 minutes. 3. Let chips cool to a crisp texture and serve. These chips are really impressive looking, but ridiculously easy to make. Bring the Artichoke Parmesan Dip and Homemade Tortilla Chips to a BBQ this weekend (but be prepared to give out the recipes all day)! I’ve been on the search for a good artichoke dip recipe. Usually I just buy the tub from Costco but I live like 40 minites away from the artichoke capital of the world (so they claim.) I really should make it from scratch. You totally should… it’s so easy! this recipe sounds great, but what do you do w/ the reserved marinade?